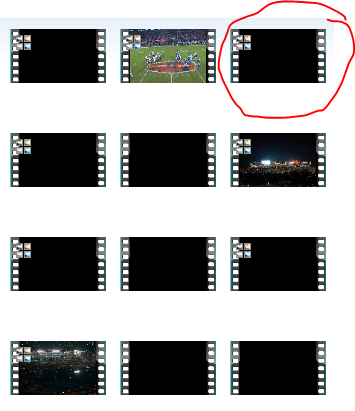 Every year, I record the Superbowl and create a DVD with just the game with no commercials, and the a separate disc with just the commercials and the entertainment (halftime concert and so forth). This year I bought an ATI Digital Wonder CableCard tuner and recorded the CBS high definition cable feed and it came out beautiful. This year I decided to use Microsoft’s free Windows Live Movie Maker to edit the 1080i video, which is stored in a Microsoft TV file. While it has done a fine job, I ran into some issues that I hope will make it to the Live Movie Maker product team so they can make this an even more stellar product. I have categorized my list of entries as Feature Requests, Update Requests, and Bugs. Bug: Live Movie Maker does not appear to continue encoding / saving a video if the computer locks. This is a problem, since Windows 7 automatically locks a computer after 10 minutes by default. Figure: I started encoding at about 12pm, and the app appeared to be encoding just fine, at the 3% mark after 20 minutes. I left for lunch. My computer had locked the screen, and I didn’t touch it again for a few hours. When I unlocked it around 3pm, it wasn’t even past 7%. But the percentage meter started moving again after unlocking. As long as I prevented the computer from locking (it was plugged into a power supply and did not go to sleep), the video kept encoding. I got to the 41% mark before I left for the day. I left the laptop at the office overnight, and when I arrived in the morning and unlocked the computer, it was only at 60%. Ouch. Maybe it doesn’t stop encoding, but it sure does slow down to a short-bussed snail’s pace. Bug: Timeline preview doesn’t always appear to work, especially with high definition video. It just remains a long black area. 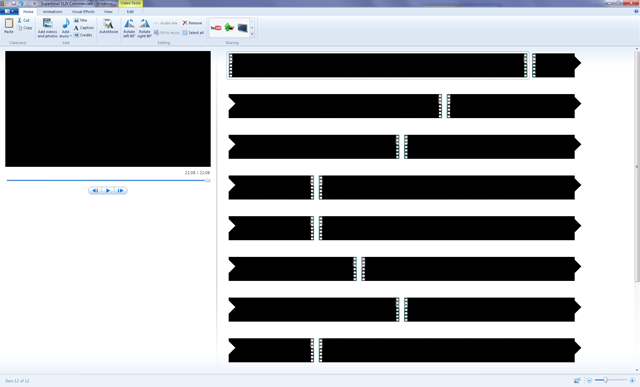 UPDATE: It is actually not a black bar, it’s just the first frame of the video, continuously repeated. Figure: Screen shot of the timeline bug. Feature: Utilize GPU video encoding. Feature: Save individual clips / trimmings as video files. Feature: Assign names to individual clips / trimmings. Figure: How do I tell these clips apart? A textbox underneath the clip would be very helpful. Feature: Fast forward / reverse while trimming. Update: Seconds in Trim Tool is nice, but the seconds don’t show anywhere else – it’s minutes/seconds on video playback, so the position is hard to match up. Update: Provide a Properties context menu option to get information about the current video clip. Feature: Is it possible to see realtime video decoding with the slider, so we can slide quickly through video? Feature: Auto-save of projects, in case the app crashes, so you don’t lose all your work. Feature: Commercial removal feature, or a more obvious API for writing plug-ins? DVRMS Toolkit has commercial skip, so maybe that can be ported? Update: Maybe a paid version with more features? Update: Multiple in and out points in Trim Tool. Update: Ability to save in Blu-Ray ready formats like H.264 or MPEG-2, or allow plug-ins for different video encoders. Update: Make toolbars, such as effects, detachable or have them show your favorite / recent filters, since it’s a timewaster to keep scrolling down to the “fade from black” and so forth on every clip. Feature: Export to BluRay / AVCHD (this would be nice in Windows Media Center as well).